Find options that meet your customized criteria. Filter by basic option attributes or security fundamentals. Also, use more advanced criteria like volatility or option value. Quickly identify option strategies that match your risk tolerance, outlook and goals for eligible securities in your portfolio and watchlists. Search available option contracts for a particular optionable security. 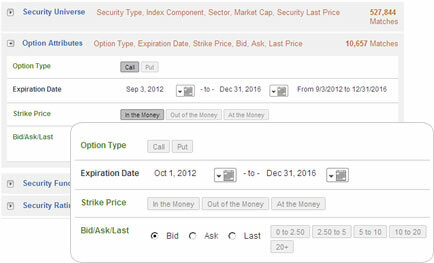 Clear, interactive listings include all the put and call option contract details such as strike prices, premiums, open interest and volume. Get in-depth, third-party research from Morningstar and CFRA (powered by data from S&P Global), plus the latest financial news from top sources. Access in-depth reports like the US Option Overwriting Trade Ideas report which highlights single-stock covered call writing opportunities, generated through quantitative screening. Help build a solid foundation on options investing. 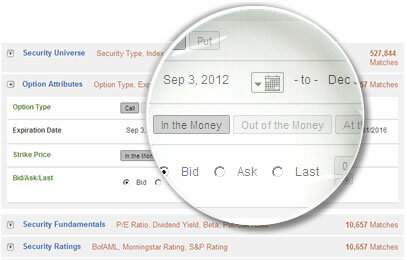 Our customizable trading platform lets you trade, research, monitor watchlists and more. Options carry a high level of risk and are not suitable for all investors. Certain requirements must be met to trade options. Please read the options disclosure document titled "Characteristics & Risks of Standardized Options" before considering any option transaction. A separate client agreement is needed. Please note that you will also need to be preapproved prior to implementing this strategy. Multi-leg option orders are charged one base commission per order, plus a per contract charge.